We have an unhealthy obsession with headphones. Seriously. We own way more headphones than we care to admit. Put it this way, the number is way higher than the number of compatible devices we own. Why must we continually purchase new cans if we only have two ears to use them with? Every pair sounds different. Much like the way our musical preferences change, we also go through phases in which we prefer different headphones. Different styles of music sound better with different phones. If we were forced to choose only a single hour of music listening per day, we would no doubt choose the hour we spend at the gym. If we didn’t have tunes ringing through our ears while we were working out, we just wouldn’t have the motivation to exercise. Music is a truly powerful force. It’s even more powerful when you have powerful headphones to back it up. 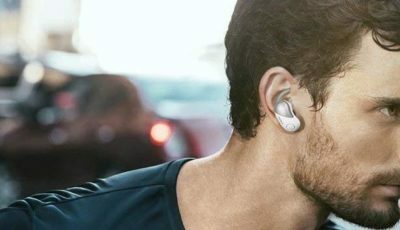 If you’ve ever worked out with a pair of wired earbuds, you know how important a Bluetooth feature can be. Wires have a habit of becoming tangled around your throat and limbs right at the wrong moment. Quality Bluetooth earbuds are hard to find. If you’re not willing to shell out hundreds of dollars for a prier wireless device, there is a clear difference in sound quality between wired buds and a wireless pair. The wireless option is typically muddier and tinnier than its wired counterparts. Finding a pair of Bluetooth headphones with decent sound quality, a comfortable fit and a decent battery life shouldn’t be as difficult as it is, but alas, the struggle is real. 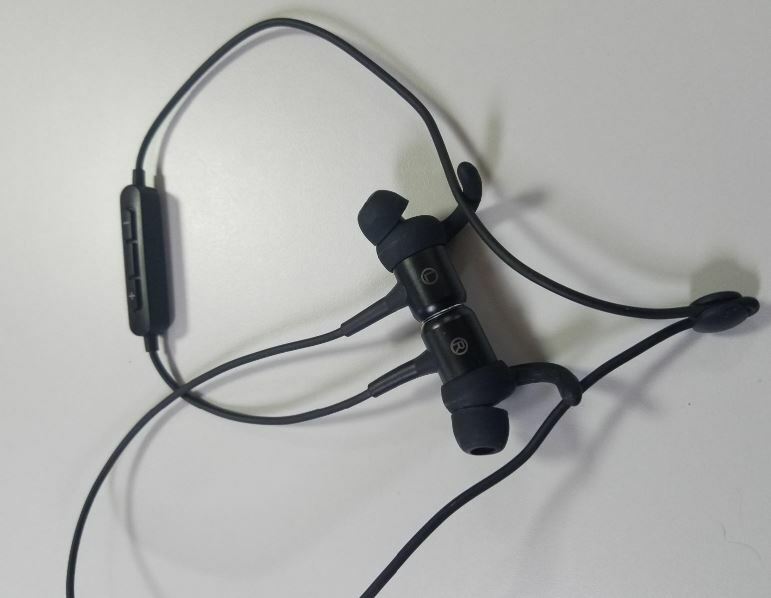 The SoundPEATS Q34 Bluetooth headphones have a great reputation. With 88 reviewers combining for a 4.5 out of 5-star average on Amazon, and at a very reasonable price, our hopes were high that the Q34s would be our new favorite audio device. We’ve tested our fair share of SoundPEATS branded headphones over the past few years, including the Q22, Q15 and Q12 models. We’ve always left our reviews impressed with the quality, so we were excited to see what the Q34s had in store for us. Over the past week we’ve had the chance to test out the popular gadget. The SoundPEATS have been glued to our ears for the past 7 days, so we think we’ve been able to get a good feel for them. 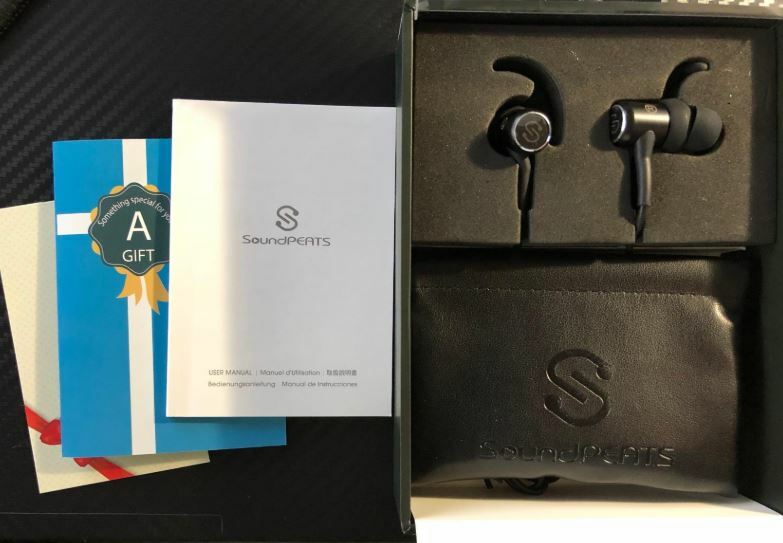 So, without further ado, here is our honest review of the SoundPEATS Q34. 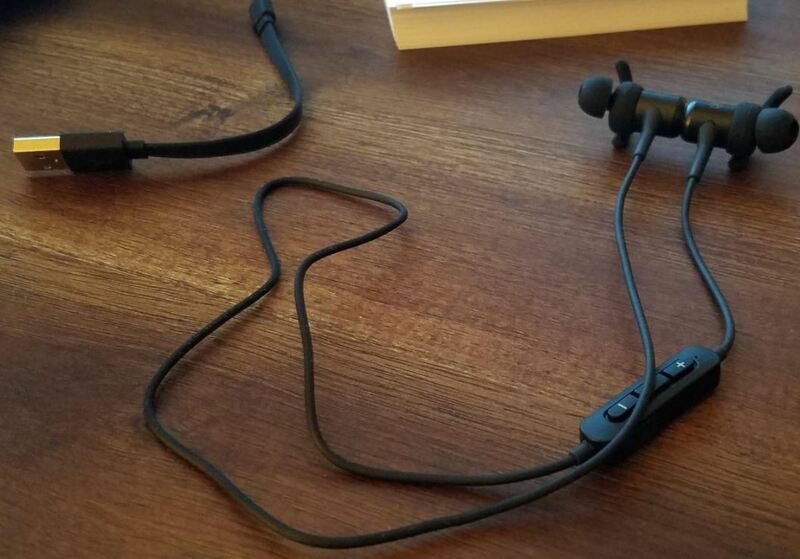 Much like the other SoundPEATS products we’ve reviewed, the Q34s are well-packaged. Budget headphones are often shipped in flimsy boxes or one of those impossible to open anti-theft packages which always wind up cutting our hands. 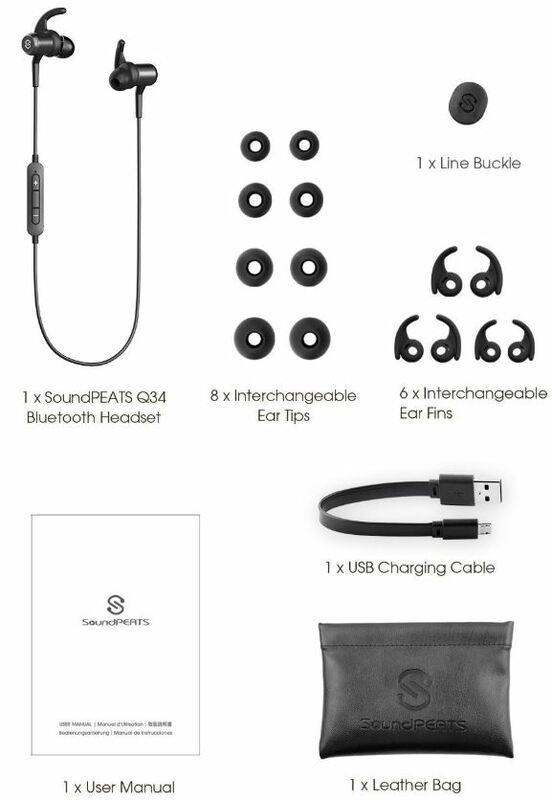 Included in the box are the headphones, a USB charging cable, 4 different sizes of ear tips (XS, S, M, L), 3 pairs of ear hooks, a line buckle, a carrying pouch and the user manual. The included pouch is flimsy, but we wouldn’t expect much more out of a budget pair. 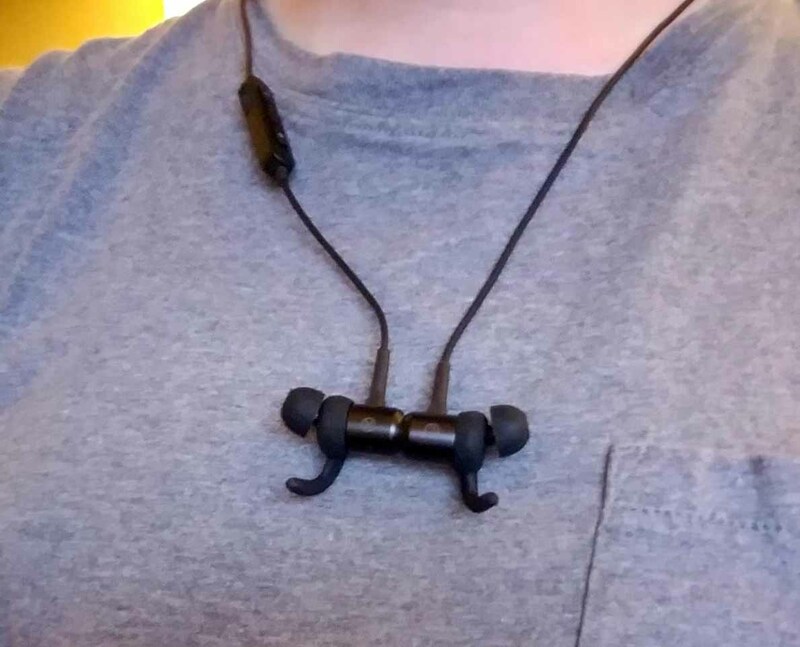 We see no need for a pouch anyway, since these are the kind of headphones that are made to be tossed in your gym bag, but it’s still a nice gesture. Most earbuds come with three different sized ear tips, even the most expensive of the bunch. The Q34s ship with four variants, adding an extra small size into the mix. Our ears are comically large, so we have no use for tiny tips, but they are nice to have just in case we want to let one of our kids borrow them for a bit. The ear tips are composed of a soft silicone and mold to your ear canal well. Rather than sitting behind your ears, the ear hooks contour to the inner curves of your ears, which is perfectly fine with us considering that behind the ear hooks always wind up leaving our skin chaffed and sore. The Q34s fit snug, which produces a deeper, more immersive sound, and reduces any distracting external ambient noise. Over the past week we didn’t experience any discomfort, despite almost constant listening. All is well on the comfort front. 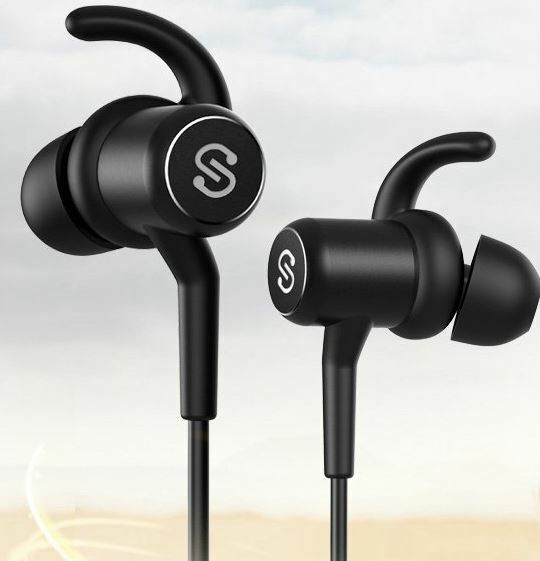 The earbuds are composed of a metallic-casing which contains two magnets, allowing the buds to attach at their rear. We love headphones that feature a magnetic attachment feature because it allows us to walk around without having to worry about the device flying off of our necks. When attached, the magnetic feature allows the buds to dangle around your neck like some sort of techy necklace. The Q34s are the most beautiful piece of jewelry we own (that includes our wedding ring. Sorry, babes, you just don’t have good taste). The Q34s run off the aptX codec, which helps significantly improve the sound performance of wireless audio devices. The first sound test we conducted consisted of some bass-heavy EDM. We wanted to determine how well the earbuds handled low frequenicies, since many headphones in the same price range feature bass that sounds muddier than a dirt road on a rainy day. While the bass was obviously not as rich as the lows you would expect out out of headphones that cost 10 times as much, we were surprised at how clear the frequencies were reproduced. Since EDM sounded decent, we moved on to some hip-hop. Same deal. Clear, deep and concussive lows that made our ears rumble with happiness. Next up we switched over to some guitar-shredding metal to hear how the Q34s handled highs. If you’ve ever used low-priced headphones, you know how shrill and tinny they can make high frequencies sound. The good news is that Kirk Hammett’s sweet, sweet licks sounded pretty darn fab. The bad news is… well, we guess there really isn’t any bad news. The quality of the highs exceeded our expectations, which is a good sign for the average user since our standards are usually higher than your average bear. Mids sounded even and snappy, but never overpowered the extreme frequencies. All in all, the sound quality is way better than the low-price would suggest. While SoundPEATS claims that the Q34s get a maximum 7 hours of active playtime, we clocked the battery life at closer to 8 hours. Companies often give themselves an hour of wiggle room, just in case some picky customer decides that their headphones weren’t reaching the guaranteed battery life span. This model is no different. A full charge takes about 1 to 2 hours, which is great if you are headphone fiends like us. A half-hour charge is plenty to give you an extra 2 hours of listening. SoundPEATS also claims that the headphones provide 190 hours of stand-by time. Now, if they think we’re going to just let these headphones sit around for 190 hours without listening turning on a podcast or audio book, then they’ve got another thing coming. Obviously, we didn’t test out the 190 hour stand-by mark since we only used them for a week, but we certainly have no reason to doubt the claims. The Q34s feature Bluetooth 4.1 wireless connectivity, which allows them to seamlessly pair with any of your favorite Bluetooth devices (and even your least favorite ones). The connectivity seems strong and we didn’t notice any latency issues, which is by far one of our biggest pet peeves. The device features a working range of 33 ft., which is plenty of cushion to cover any trips to the bathroom or kitchen without bringing the phone with us. Considering that we’re typically within 5 inches of our phone, 33 feet might as well be a mile because there is no chance we’ll be much further than 10 yards away from our device. The Q34s feature an in-line microphone, so there is no reason to disconnect your headphones to take a call. We used the headphones during, probably, a dozen phone calls and didn’t have any complaints, nor did anyone ask if we could repeat ourselves. We also tested the mic by listening in on the other end of a call, and we didn’t notice any distracting ambient noise and none of the robotic tweaks that can sometimes happen with low-price devices. Most of our communication is done through text and e-mail, so the microphone wouldn’t have been a deal breaker even if it was poor. Luckily, the mic holds its own very well. Right next to the microphone, the Q34 also features in-line controls, which we tend to prefer over controls located by the ear. When the controls are located near the ear, we often wind up pressing the wrong button, or feeling embarrassed because we look a bit silly. The controls on these earbuds are very compact. This allows the in-line control unit to be kept small and unobtrusive, though the trade-off is that the buttons aren’t the easiest to manage. While the controls are raised enough to be differentiated easily, the compact design creates the possibility of false presses. We only pressed the wrong button 1 or 2 times, out of what was probably hundreds of presses, so while it’s not a huge problem, it might be an annoyance for some. The Q34s are the most impressive SoundPEATS earbuds we’ve ever owned, and they rank right near the top of budget priced headphones. When we saw their 4.5 rating on Amazon, we approached them with a skeptical eye, since it is becoming more and more tricky to trust Amazon reviews. Luckily, we found the Q34s to be worth all the hype. 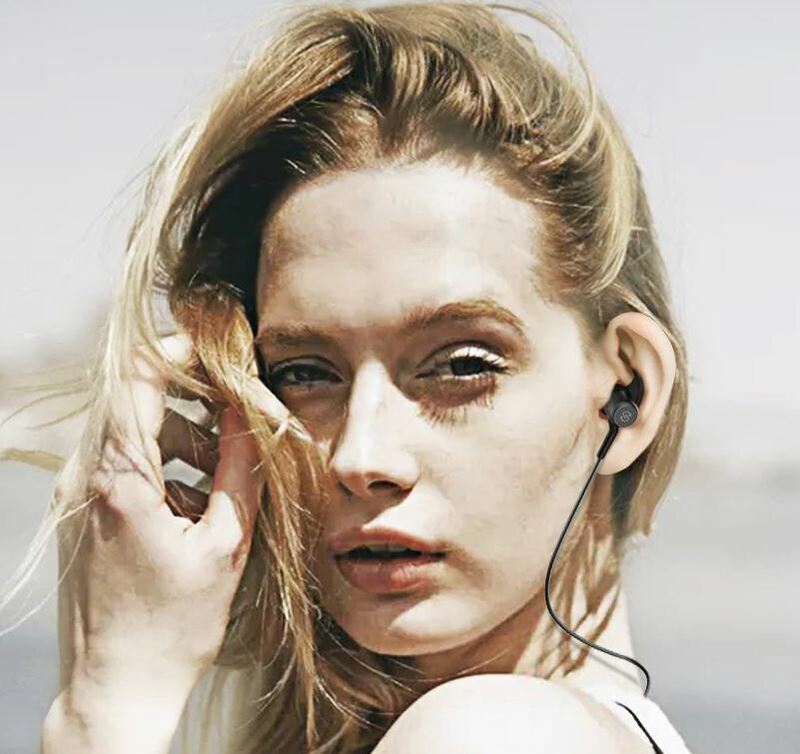 With their balanced and powerful sound, contoured comfort, super portability, strong connectivity, low latency and long battery life, these are a pair of buds you can rely on for consistency and endurance. If you’re currently living life on a budget, the Q34s are a solid pair of low-priced earbuds. We know that once you click on the Bluetooth audio category on Amazon, you are literally slapped in the face with a massive list of cheap devices. It can be hard to wade through the mess. When it comes down to it, you’ve got to pick one of them, and the SoundPEATS are a good, reliable choice. What can I say? I love electronics and all things gadgets. I started this website to uncover the latest happenings in the complex world of technology. Need some help? Reach out! Drop a comment below or contact me directly. Enjoy! Tech Moar Copyright © 2019.